This is another shot from our visit to the Masai Mara in the late 1990s (See also: Cheetah). It depicts one of the most dramatic moments in our safari. We were driving along when we came across a young, dead zebra – possibly dead at birth. After a couple of minutes along came a lioness and started to drag it away. 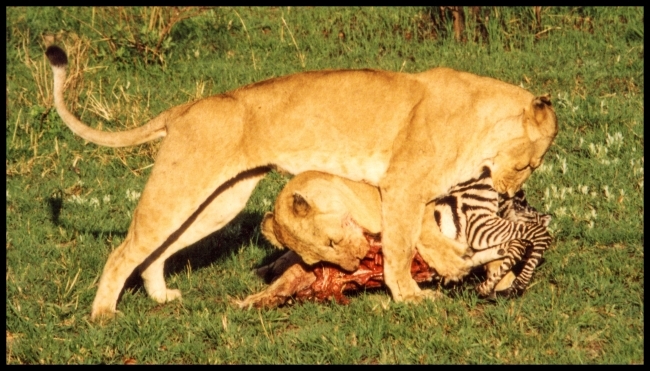 Not long afterwards a second lioness arrived and grabbed another part of the dead zebra. This led to a lengthy “tug-o-war” with both lions trying to take possession. As I recall one of them managed to tear of a small piece, which it then took away while the second dragged away the larger portion. Taken with a Canon AE-1 and, if my memory is correct, a Vivitar 70-210 mm lens.